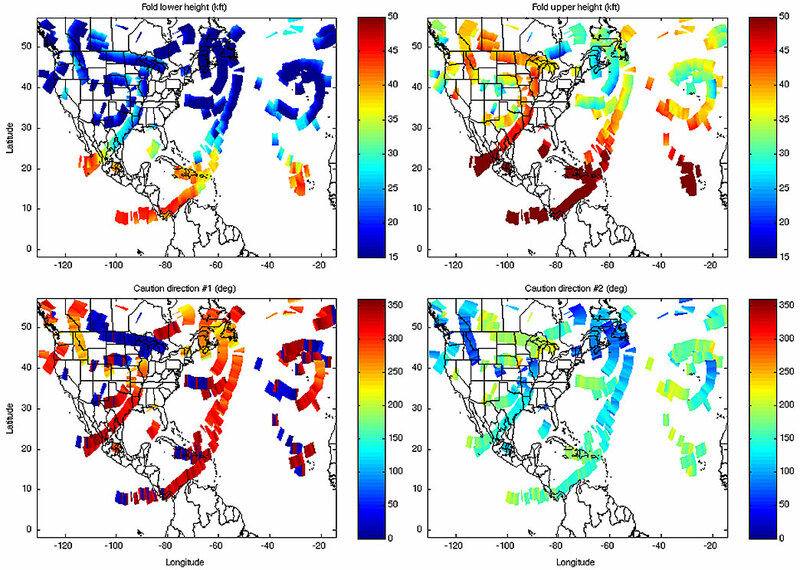 Example of the tropopause folding turbulence prediction products for April 6, 2006, 23:45 UTC. Upper left: fold lower height (kft); Upper right: fold upper height (kft), Lower left: caution direction #1 (degrees); Lower right: caution direction #2 (degrees). At the upper-tropospheric boundary between air masses, the vertical shearing at the jet stream combined with the ageostrophic convergence of polar, subtropical, and stratospheric air produces a region known for its potential for clear air turbulence called a "tropopause fold." These features are evident in satellite-observed upper tropospheric water vapor by the large-scale spatial gradients in brightness temperature, which define boundaries between the air masses. The tropopause fold extends from this boundary to a limited distance into and underneath the wetter air mass. The tropopause folding turbulence prediction (TFTP) product is designed to locate these regions in the atmosphere and identify the sections most likely to produce turbulent flight conditions for aircraft. The upper-tropospheric water vapor channel of the GOES-R Advanced Baseline Imager is the source for resolving gradients that reveal the horizontal distribution of tropopause folds. The aviation weather community will be able to use this information to warn pilots of areas likely to have turbulence, further preventing aircraft accidents due to weather.